This week I've been getting settled in as I took a few days off after we got back from the vacation. I don't enjoy jumping right back into work and these extra few days awarded me some time to play creative catch-up with some overdue hobby time! I cleaned up my desk, experimented with basing, started a new painting project, and ran some errands– one of which included shipping off my Secret Sophie exchange package to my mystery person halfway across the country. The week before I left for my vacation, I was really inspired by James Wappel's myriad of basing techniques he features on his blog. I decided to purchase a bottle of Vallejo Oxide Paste that Jim frequently uses in his basing adventures, along with some new super glue, cork, and some wood chips. I was excited to get back and start playing with these new materials! I don't have a lot of basing materials (though I have more thanks to Traxia! ), so when I took a break to walk the dog, I took a pair of scissors and a ziplock bag to bring back any interesting natural materials I found along the way. I found a few good-sized branches, some dried berries that would undoubtedly make some good alien eggs in a sci fi base, and some tiny little flower buds that would add some plant/vegetation interest (and is different from the grass & flock I already have). 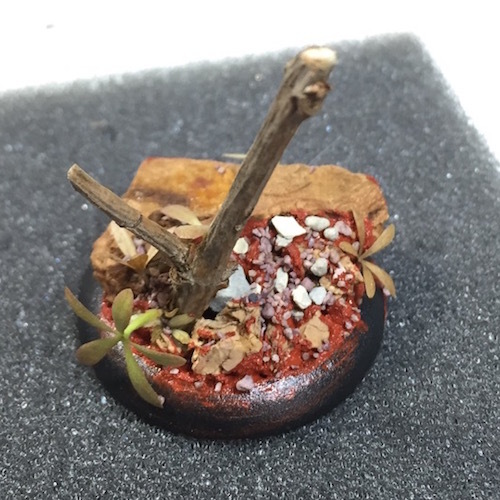 I combined some of these elements and came up with this 30mm base below. I worked in some clay-based gravel, bits of cork, and the Army Painter battleground ballast that I always have on hand. The next step will be priming it– I think the various textures will turn out quite interesting! Since I was on a roll with bases, I finally attached Carla to her primed base with careful pinning– this will make it much easier to handle her as I finally get her finished. In addition to the basing adventures, I started on a new project: a group of harpies. What do you call a group of harpies? A flock? A brood of harpies? Anyway, I knew the assembly would take awhile so I made myself a Hibiscus Mimosa on Sunday and sat down to get to work. It took awhile, since it was a mix & match free-for-all, but the hard work paid off. I glued, sanded, washed them before priming. I'll start highlighting up from this base color so they'll end up much lighter than they are currently. Now I just need to decide what to paint the wings– I'd like them to blend into a different color (even if it's just a lighter or darker variation on the skin tone). These harpies have leathery wings that hold gruesome items like skulls and severed hands. I'll be doing my best to keep them hideous, so I may go for a darker wing hue in order to make the chains and skills stand out by contrast. My only worry is the clean plastic rods that I'll need to use to attach them to their base. The harpies don't have many obvious points of contact for this, so I'll need to get creative!